The Little Dwarf by Zambeza Seeds may not look like much at first glance. Not that this fact would be a disadvantage whatsoever because it’s exactly her compact size which makes Little Dwarf the perfect plant for stealth and guerrilla grows if you want to keep under the radar. Given that she has famed Skunk genetics, she’ll also shine with respectable yields, a great taste and a superb high! Zambeza Seeds' Little Dwarf is somewhat like the Bonsai among cannabis strains, given that she will likely only grow to heights of 40-70cm. But don’t let her size fool you. Zambeza took the proven Skunk and paired her with a Ruderalis to give her autoflowering qualities, making for a little yet nevertheless outstanding autoflower. The sturdy and compact Little Dwarf can be the perfect plant if you want to keep your grow-op out of sight from nosey eyes. She can be a great plant to grow for stealth grows or simply if you happen to be limited in space and want to max out your harvest. You can grow her indoors where she’ll reward with good yields of up to 250g/m² or outdoors where you can expect up to 80g per plant if conditions are right. She can be the perfect choice to grow on your balcony, terrace and basically any spot that will get some sun during the day. Given that the Little Dwarf is an autoflower with proven and always-reliable Skunk genetics, growing her is really a piece of cake and won't cause troubles even for less-experienced growers. Simply germinate her and watch her go through her short life-cycle of only 55-65 days and get ready to harvest some prime Sativa bud that sure won’t disappoint! Little Dwarf doesn’t break records when it comes to her THC content which measures “only” a moderate 14%. But this too shouldn’t fool you since her effect is anything but weak. This Sativa-dominant autoflower delivers an awesome high that is creative and happy, a good smoke that you can enjoy any time of the day or at night. When you smoke her, you will absolutely notice the Skunky notes which perfectly blend sweet and spicy flavours into a deeply satisfying smoke experience. 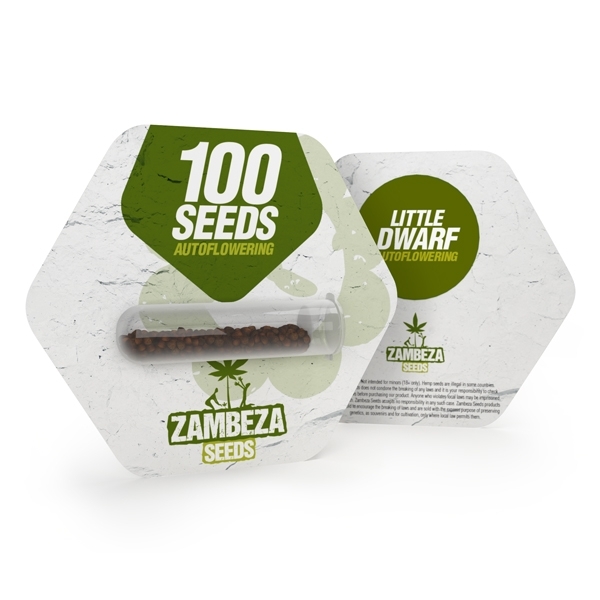 Little Dwarf bulk seeds by Zambeza is by no means a “compromise strain”. With qualities equal and sometimes better than those of much “bigger” strains, this is a fantastic autoflowering variety that won’t let you down. She can be a good choice for anyone who wants to hide their grow but she’s also great when you’re new to growing or happen to be a seasoned grower who simply wants a rewarding autoflower that is much greater than judging from her size alone. Little Dwarf Autoflowering Bulk is available in packs of 100 seeds which can make her a recommended choice for the grower who requires more seeds.